Hey there! How is everyone's week going so far? It's been a busy one here so far, and I've fallen behind in my blogging so I thought I'd take a few to share another Mother's Day card I made. This one was for a co-worker's wife from him and his daughter. I selected Saturated Canary's Queenie and Princess to color. He told me his wife is not just "Queen For A Day" but Queen for Always". And I guess that would make his daughter a princess! So, perfect, right? The image is colored with Copics and cut using the Labels Twenty Two Nestabilities (Spellbinders). I used a circle sentiment freebie from Netty's Cards. It is cut using Classic Cirlces Nestabilities (Spellbinders). I love my new Little Darlings Rubber Stamps Lovely View die! 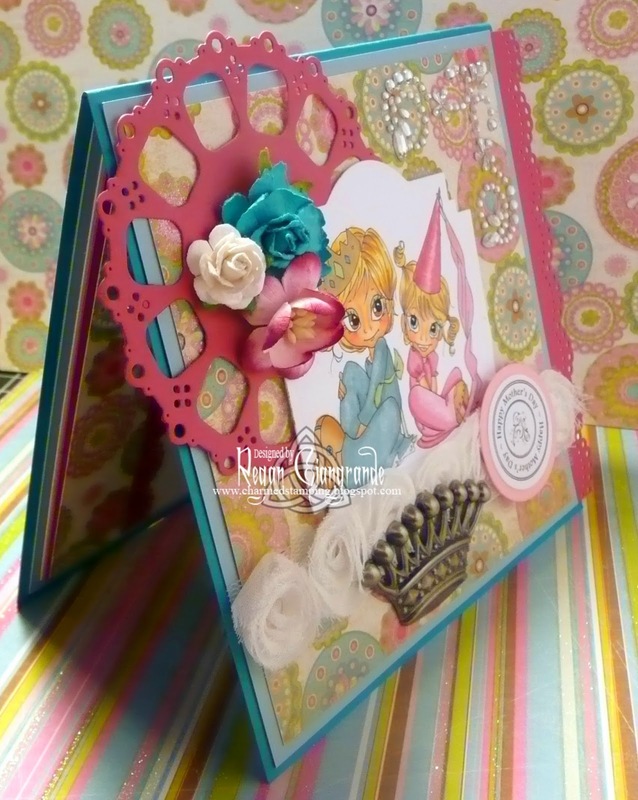 It is also by Spellbinders, exclusively for LDRS! The border punch is Martha Stewart. Papers are My Mind's Eye - Penny Lane. I added a few flowers from my stash plus flower ribbon and a metal crown from Tim Holtz. And let's not forget a bit of bling for these adorable royals! I put a touch of Stardust pen on the princess' veil and added a Recollections rhinestone corner. 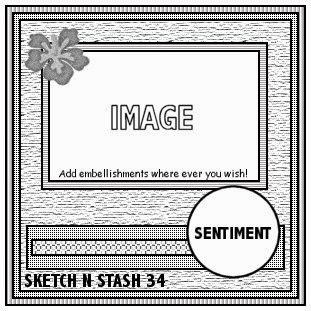 I missed the link up for the sketch but it's Sketch N Stash (#138). Krista's images are some of my favorites to color and work with! She has been releasing new images every Saturday and it has been hard to resist! So why try, right? lol I'm waiting for one special image to make it's appearance... Hopefully soon! Thanks for visiting and enjoy the rest of your week! 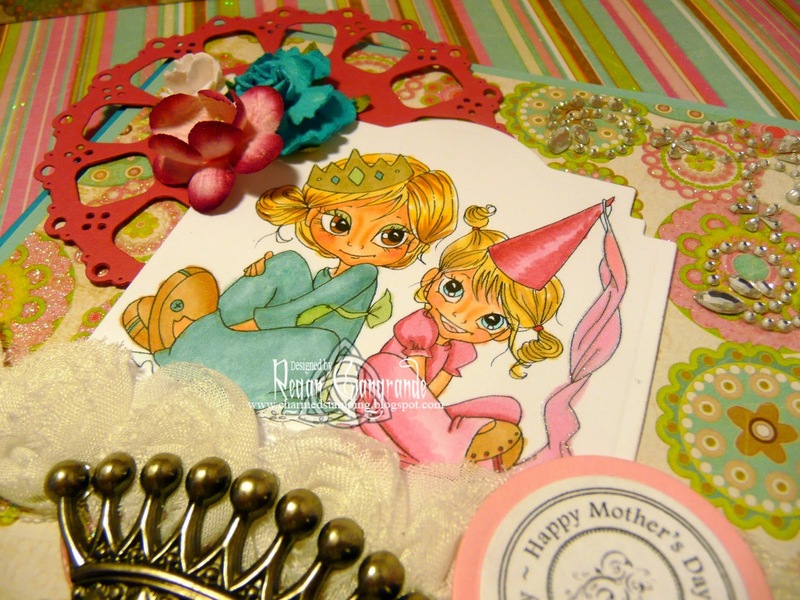 I have lots of crafting to do but I will try to pop in with my final Mother's Day card soon. Markers used: Copics (E00, E11, E21, E23, E25, E31, E34, Y23, Y28, Y32, Y35, B00, BG70, BG72, YG61, R20, R32, R81, R85). Way too cute and that is an adorable image! Thanks for joining us at Fitztown Challenge Blog. Hope to see you again and good luck! I hope you noticed we’re having a DT call as well! Be sure to let all your friends know! You can read all the details here. To cute for words, love it. Thank you for joining TTCRD this week. this is just soooo cute. I love the image and the bright colours and that lovely crown you added to it. Thanks for joining us at Fitztown. Good luck. Hope to see you again soon, and especially next week when are having a Birthday Blog Hop ! !